By picking CLU for college, Riley Thomas (r) was able to stay close to family, including her three dogs and 22 horses, in the Santa Rosa Valley. Still, although the senior biology major has always thought about becoming a vet, she didn’t expect to begin her education in veterinary medicine in college. That changed after chemistry professor John Tannaci, who advises the campus chapter of the American Medical Student Association, approached Barry Fisher, M.P.P.A. ’07, about creating medical internship programs for students. Fisher is both president of CLU’s Community Leaders Association and chief deputy director of the Ventura County Health Care Agency, which manages the county animal hospital located near Camarillo Airport. 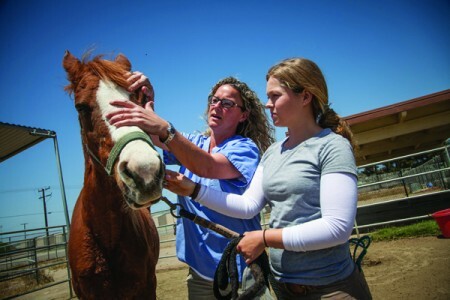 Now, two CLU students are getting their hours in the veterinary field – required by graduate schools – by working with Dr. Heather Skogerson, who said she was happy to have the extra hands to feed and care for animals or even scrub them for surgery.